Guernsey Rugby coach Jordan Reynolds says his side's injury crisis is "not going to allow" them to fulfil their hopes of winning National Three London. 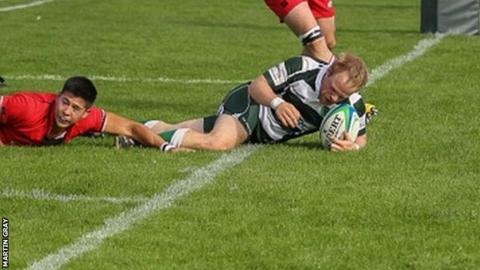 The Sarnians lost 40-19 at home to Barnes on Saturday with Reynolds having 12 first-team players out. The loss leaves Guernsey, who were third from bottom with one win this season. "Normally you don't try to use injuries as an excuse, but there's no reason not to use it at the moment," he said. "We're so depleted, a lot of guys that have helped us out aren't regular first-team players, some aren't even second-team players, but that's the state we're in at the moment. "We're willing to take our punishment now and not try and rush it because that will just prolong the injury list." "We're going to be the same way for the next five or six weeks, hopefully we can get through it and the guys performed as best they could," Reynolds told BBC Radio Guernsey. And while hoping to make the top four, Reynolds had held ambitions of pushing for the league title, but those hopes have now been dashed. "To be honest, there's not much I can change to the side, I've only got a handful of guys to pick from. "It's a frustrating time for us as we did have ambitions to be up in the top two this year. "This is obviously not going to allow that to happen, hopefully if we get back on track in the next couple of weeks we can aim for a top-five spot. "We're willing to take our punishment now and not try and rush it because that will just prolong the injury list and we need to get everyone back fit and healthy before we start playing them."